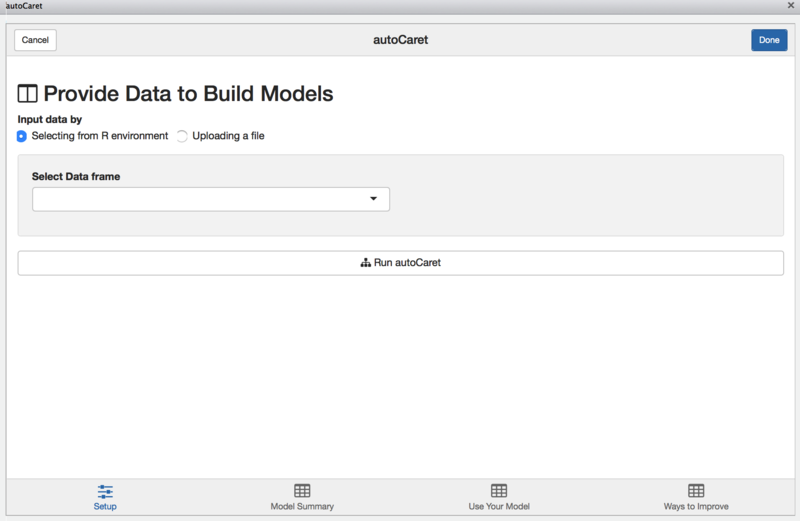 Currently, the autoCaret package is not hosted on CRAN, but can be obtained from GitHub. To do so, first make sure you have devtools installed. 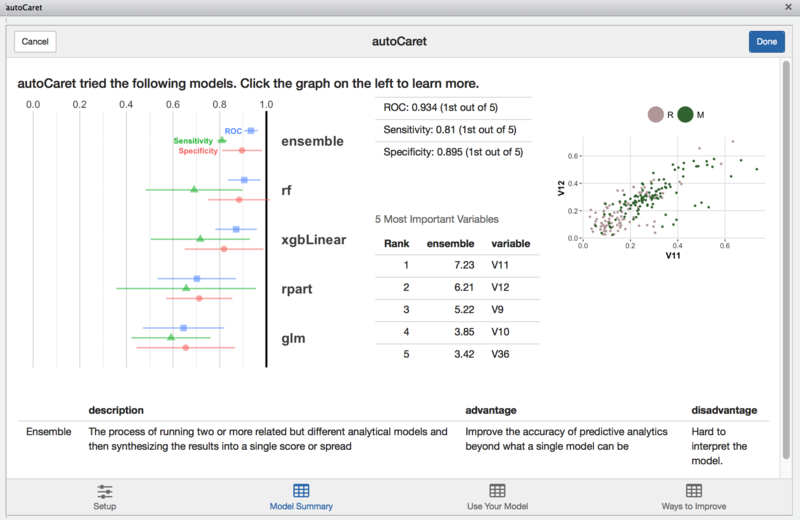 Additionally, the RStudio IDE includes integrated support for using autoCaret as an add-in. These features are available in the current Release of RStudio. We begin by loading the mlbench package and some example data Sonar which is commonly used to binary classification problems. In this example, we will attempt to distinguish Mines (M) from Rocks (R) using binary classification with an initial dataset of where N=208 and P=60. As a general rule, when using autoCaret::autoModel defaults, datasets less than 100 mb should yield optimal performance and likely avoid extremely long run times & high memory requirements. #>   "V1"    "V2"    "V3"    "V4"    "V5"    "V6"    "V7"    "V8"
#>   "V9"    "V10"   "V11"   "V12"   "V13"   "V14"   "V15"   "V16"
#>  "V17"   "V18"   "V19"   "V20"   "V21"   "V22"   "V23"   "V24"
#>  "V25"   "V26"   "V27"   "V28"   "V29"   "V30"   "V31"   "V32"
#>  "V33"   "V34"   "V35"   "V36"   "V37"   "V38"   "V39"   "V40"
#>  "V41"   "V42"   "V43"   "V44"   "V45"   "V46"   "V47"   "V48"
#>  "V49"   "V50"   "V51"   "V52"   "V53"   "V54"   "V55"   "V56"
#>  "V57"   "V58"   "V59"   "V60"   "Class"
Having both the data loaded and having inspected it, we can now make use of the autoCaret::autoModel() function. In this example, we’d like to try and distinguish Rocks (R) from Mines (R), so we will attempt to predict the Class variable in the Sonar dataframe. Using it’s defaults, autoModel has 2 arguments we need to specify: df and y.
df is the Dataframe that we’d like to use build a binary classification model, while y is our classification target or response variable. We can use a non-exported package function, autoCaret:::checkBinaryTrait to determine if our y variable is indeed binary. The autoModel functionality will perform this for us as well. We used the four default models to create an ensemble. Using the ensemble model that was generated to predict on the test set yield predictions with 92% accuracy. We can also access each of the object variables included in the above displayed summary output via the object itself. #>  "glm"       "rpart"     "rf"        "xgbLinear"
So now that we have a sense of how successful our auto modeling approach was, we’d likely want to use the model, mod, we built previously to make predictions on new data we receive. Because this is an illustrative example, we’lll take a shortcut by just resampling the same data that we used to train on. 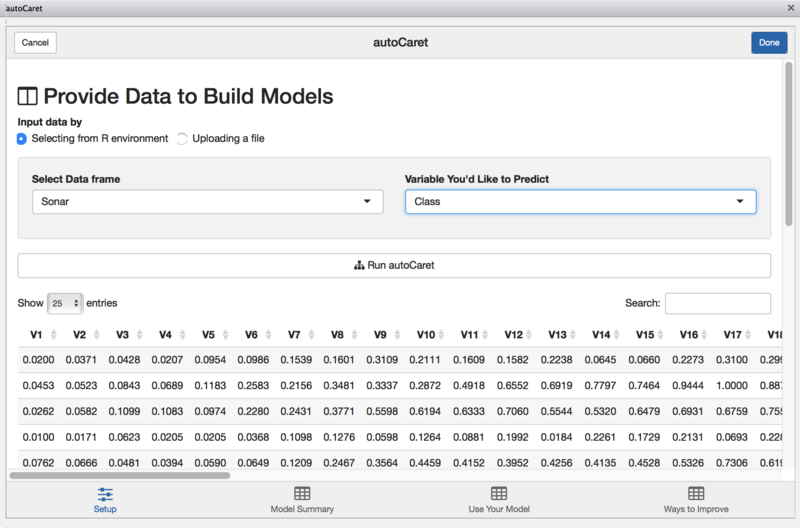 The main point here is that you can simply pass your autoCaret model object, mod, into the predict() function along with new observations to generate predictions. How well did we do? Well a confusion matrix from the caret package can tell us! Note: we wouldn’t expect this level of accuracy using real data given we resampled from our original training set. ## How well did we do? As an alternative option to the CLI, we provide an intuitive GUI in the form an RStudio Addin. By running the following non-exported function autoCaret:::autoCaretUI(). When launched, you’ll be presented with the following screen. Note: There will be nothing available to list if you have yet to load a data.frame in your local Global environment. With the Sonar data.frame selected, we’ll be presented with a preview of our data to visually inspect. Once we select the appropriate variable to predict, clicking Run autoCaret will launch the underlying process. When modeling completes, the other tabs in the Addin are enabled and you may select them to view their contents. 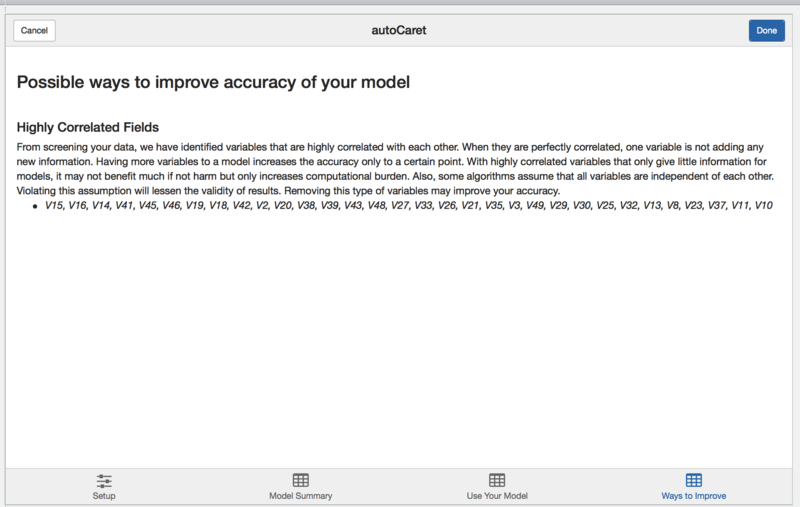 The model summary screen provides an interactive way for you to review the resultant model object created when running autoCaret. Clicking on the left hand side results visualization provides a layer of interactivity. This is a useful for comparing the results of various models tried during the training phase and for gaining a better intuitive sense of the strengths and weaknesses of your models. Like in the section above, we use the new data.frame to simulate predictions. Having it pre-exist in our Global Environment, we can select it from dropbown on the Use your model tab. Once we compute predictions, they will be saved in our Environment and named autoModelPredictionResult. 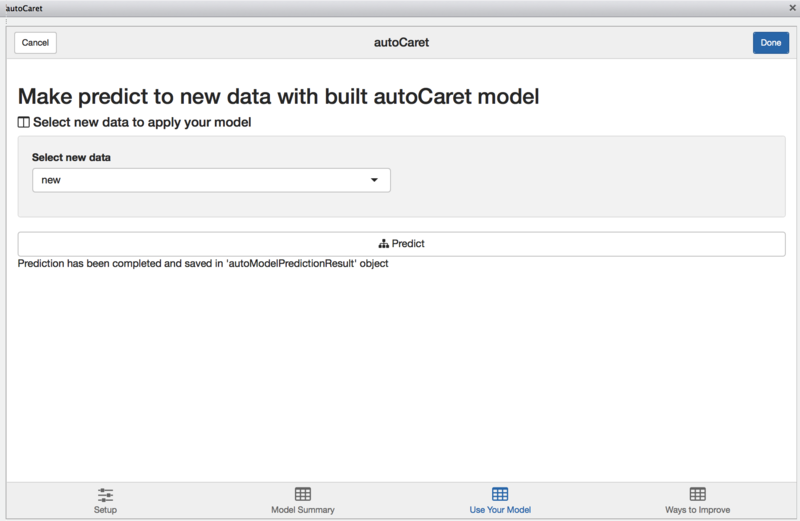 Finally, during the modelling process, autoCaret runs a variety of diagnostics that help validate the underlying distribution and features of your data prior to pre-processing. Depending on what we find, we surface these as qualitative suggestions on the learning more tab. Feel free to review and incorporate these suggestions in the data cleaning step as you build binary classifiers with autoCaret.